Opening Friday 8 January 2016, 7pm with a performance by Jeneen Frei Njootli. Group artist talk: Saturday 9 January, noon. 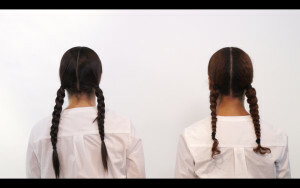 enendaman | anminigook (intention | worth) brings together four contemporary artists whose works reference the Indigenous traditions/teachings, matriarchy, and genetic memory that reverberate between the past and present. enendaman | anminigook investigates the complexities of authorship within contemporary Indigenous art. The exhibition features new works from: Wendy Red Star (PO), Amy Malbeuf (AB), Kenneth Lavallee (MB), and Jeneen Frei Njootli (BC). It spans cultural practices such as regalia, caribou hair tufting, mark making, and Ceremony utilizing the mediums of sculpture, painting, video, and performance. Together the works act upon and expose a unique authorship/voice inspired by Indigenous matriarchy that is grounded in the artists’ personal experience. The exhibition highlights elements of Indigenous social, political, Ceremonial, and physical territories that were passed on by Indigenous females. These territories are acknowledged by each artist as Indigenous knowledge bases that are composed of history, blood memory, stories, and matriarchy that transcend time. The authorship becomes shared: the artist remains central in the work but there is a sense of the continuum of Indigenous knowledges that celebrates recentering Indigenous women through actions of generative processes and resistance. This exhibition is the result of a unique partnership between aceartinc. and the Aboriginal Curatorial Collective that is funded by the Winnipeg Foundation. The Indigenous Curatorial Residency is an initiative that provides support for an emerging Indigenous curator to mount an exhibition. 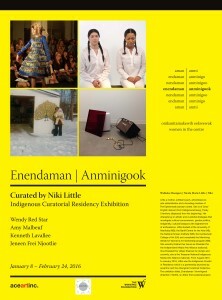 enendaman | anminigook is Niki Little’s first curatorial project. The title of the exhibition is in Oji-Cree from Kistiganwacheeng, Treaty 5 territory. Chi-miigs also to the Canada Council, Manitoba Arts Council, and the Winnipeg Arts Council for their ongoing support. Niki Little is an artist/observer and arts administrator whose works extends from curating, arts coordination and a studio-based practice. She is interested in artistic and curatorial strategies that investigate cultural consumerism, gender, and cultural Diaspora with a hint of youth-inspired ambivalence along the way. She is a member of The Ephemerals, a female Indigenous art collective based out of Winnipeg, MB. Wendy Red Star is of Crow and Irish descent from Billings MT, just outside of the Crow Indian reservation where she was raised. She holds an MFA in sculpture from UCLA. Red Star’s work explores the intersection between life on the Crow Indian reservation and the world outside of that environment. She currently lives in Portland (OR) where she is an adjunct professor of art at Portland State University. Amy Malbeuf is a Métis visual artist from Rich Lake, Alberta, Canada. Malbeuf utilizes the practices of caribou hair tufting, beadwork, installation, and performance to explores notions of identity, place, language, and ecology. Malbeuf lives and works in Kelowna where she is working towards an MFA from the University of British Columbia Okanagan. Kenneth Lavallee is a Winnipeg born artist, an alumnus of the University of Manitoba with a Bachelor of Fine Arts. Primarily through the use of painting, drawing, and silkscreen, Kenneth produces personal work embracing traditional ideas of balance, interdependence, and order in nature — the cosmos, both aesthetically and thematically. Jeneen Frei Njootli is a Gwich’in artist and a founding member of the ReMatriate collective. Her practice concerns itself with Indigeneity-in-politics, community engagement, and productive disruptions. Frei Njootli graduated with a BFA from Emily Carr University and is currently pursuing her Master of Fine Arts degree as an uninvited guest on unceded Musqueam territory at the University of British Columbia. Vernissage le vendredi 8 janvier 2016 à 19 h avec une performance par Jeneen Frei Njootli. Présenté par aceartinc. et la Aboriginal Curatorial Collective. Subventionné par la Winnipeg Foundation. enendaman | anminigook (l’intention/la valeur) rassemble les œuvres de quatre artistes contemporains qui font référence aux enseignements et aux traditions autochtones, la matriarchie, et la mémoire génétique qui réverbère entre le présent et le passé. enendaman | anminigook explore les complexités des droits d’auteur de l’art indigène contemporain. L’exposition met en montre de nouvelles œuvres de : Wendy Red Star (PO), Amy Malbeuf (Alta. ), Kenneth Lavallee (Man. ), et Jeneen Frei Njootli (C.-B.). L’exposition présente des pratiques culturelles telles que les habits, le touffetage de fil de poils de caribou, la création de marques, et la Cérémonie, en se servant des médiums de la sculpture, de la peinture, de la vidéo et de la performance. Les œuvres agissent ensemble et exposent les droits d’auteur de l’œuvre unique, surtout de la voix inspirée de la matriarchie indigène qui est ancrée dans l’expérience personnelle des artistes. L’exposition souligne les éléments indigènes sociaux, politiques, cérémoniaux et les territoires physiques qui leur ont été légués par les femmes indigènes. Ces territoires sont reconnus par chaque artiste comme étant des connaissances indigènes constituées de l’histoire, de la mémoire du sang, des histoires et de la matriarchie qui transcendent le temps. Cela devient une œuvre de collaboration : l’artiste est toujours central à l’œuvre mais il y a un sens d’un continuum de connaissances indigènes qui célèbrent un recentrage des femmes indigènes par la mise en action de processus génératifs et de la résistance. Cette exposition est le résultat d’un partenariat unique entre aceartinc. et le Aboriginal Curatorial Collective, subventionnée par la Winnipeg Foundation. La Indigenous Curatorial Residency est une initiative qui prête appui à un commissaire indigène émergent pour lui permettre de monter une exposition. enendaman | anminigook est le premier projet de Niki Little en tant que commissaire. Le titre de l’exposition est en oji-cri de Kistiganwacheeng, territoire Treaty 5. Nous remercions également le Conseil des arts du Canada, le Conseil des arts du Manitoba et le Conseil des arts de Winnipeg de leur appui continu.